For the past 28 years, Wichita Falls, TX has played host to one of the largest bike rides in the US - Hotter N Hell 100. Part of the festivities surrounding the ride is the biggest consumer bike trade show in the state. 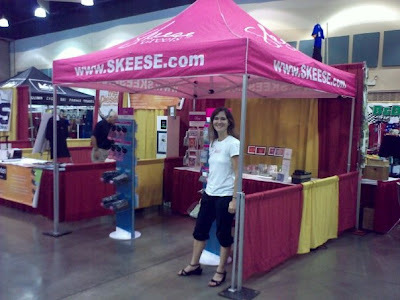 All near-by bike shops attend, as do many other vendors including Clif Bar, Bicycle-Gifts.com, SpiBelt, REI, Koobi Saddles, Pearl Izumi, and this year Skeese Greets! Working an expo can be difficult and tiring, especially when you're there alone, but I still love doing it. Since I know many people in the industry, they offered me the chance to take a few short breaks over the three day period. One stranger even brought me BBQ because he knew I couldn't leave the booth (& it was probably the best BBQ I've ever had!) I had the opportunity to introduce many new people to the product and also talk to those who are familiar with and love the cards. Will I make the 5 hour trek again for HH100 2010? I don't know. But I will be at two other expos coming up the weekend of October 23-25 - Longhorn Ironman 70.3 and at the LiveStrong Challenge. Stop by and say, "Hi!"